The Youth Climbing Club is structured to provide kids, ages 7-12, the opportunity to discover and learn about the sport of rock climbing. Club meets once a week from 4-6pm. Beginning on March 2, 2017 we are expanding our Club program to launch a Thursday Club, in addition to our existing Tuesday Club. Each Club day will be limited to 16 kids. Your child must attend the day they sign-up for (there are no make-ups on the other day and no switching back and forth between days). Please call for available space in this program. 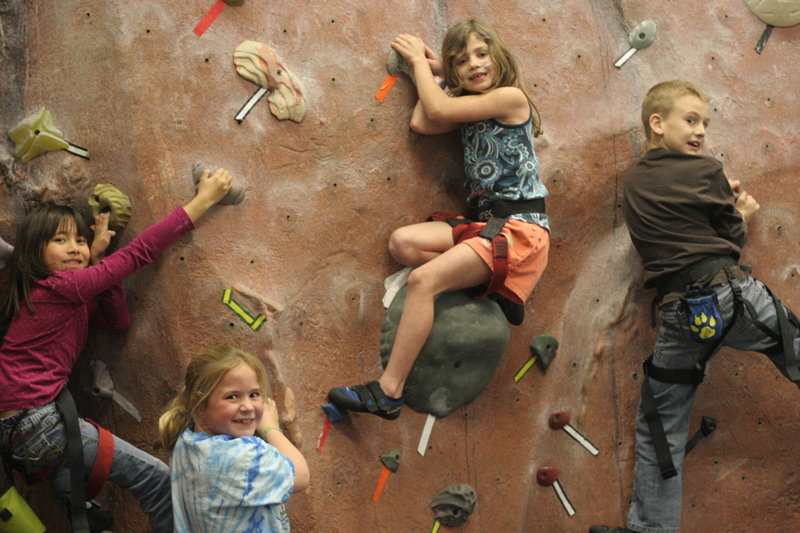 Under the guidance of dedicated instructors, kids learn basic rock climbing skills, as well as work at improving balance, strength and coordination. The sport of rock climbing will also help your child develop self-confidence and self-esteem while also learning other life skills such as teamwork and communication. In addition to climbing, other activities during Club include games and obstacle courses in our Adventure Village area. First time visitors are invited to join us on the first Tuesday or Thursday of the month if there is space available (please call ahead) to try out one session for just $20 – no commitment necessary. At the end of the session, if your child likes what he or she experienced and you would like to join the Club that night, we’ll credit the $20 toward their first months dues of $79. Equipment rental is included during Club time (Tuesdays or Thursday).